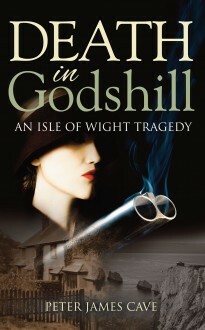 Death in Godshill begins early one morning in October 1940, on a quiet farm on the Isle of Wight, 61- year-old farmer Frank Cave was found dead, killed with his own shotgun. After a police investigation, the woman who raised the alarm, Frank’s young housekeeper, Mabel Attrill, was charged with his murder. There followed a notorious criminal trial at Winchester Assizes, featuring the most prominent pathologist of the day and one of the country’s most brilliant lawyers. After many twists and turns, the trial reached an unexpected conclusion. Peter Cave, Frank’s great nephew, has now researched the story in detail. In Death in Godshill, he presents the first published account of the Mabel Attrill case. Peter Cave was born on the Isle of Wight and brought up in the village of Chale. His grandparents ran a pub at nearby Blackgang. He left the Island in 1968 having qualified as a Trading Standards Officer, and spent most of his working life enforcing consumer protection law. He has a law degree from London University and is a Member of The Chartered Institute of Arbitrators.